Welcome to Wednesday Random TV Recall, otherwise known at WRTR...because I&apos;m lazy. 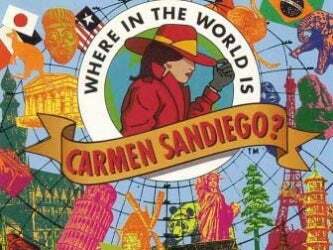 Last week I was really surprised at how many of you knew Ghost Writer, so I'm hoping you know this little gem: Where In the World Is Carmen Sandiego? Let's be honest here. This show taught me geography. I had no interest in the world around me when I was younger. It was probably the whole sheltered, country thing, but I was clueless of the world outside of the east coast of the USA. I took to saying the word "Gumshoe" a lot. But the fondest memory of the show were the songs. And one song in particular caused quite a stir at my house. Did you listen to it? They said "Damn!" On PBS! And it proves zombies have been cool for like ever. Join us next week for another show (or movie?) no one remembers. And make sure to go to TAYClassic gumshoes! There is an actually zombie jamboree there! And they don't give a damn if you're dead already!